Have you written a story with an exciting concept and interesting characters—but it just isn’t grabbing the attention of readers or agents? It’s time to look deeper into the story beats that create realistic and compelling character arcs. Internationally-published, award-winning novelist K.M. 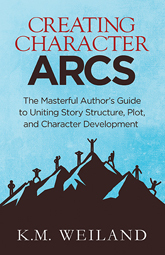 Weiland shares her acclaimed method for achieving memorable and moving character arcs in every book you write. "I've been working through Creating Character Arcs by K.M. Weiland, and I never could have believed a reference manual could be so much fun the second time through!" "Loving K.M. Weiland's Creating Character Arcs! It explains so much of what went wrong in my first draft." "Just finished reading Creating Character Arcs. It really helped me improve my characters' development."